Inaugurating the 16th International Energy Forum (IEF) ministerial here, being held in India after a gap of 22 years, Modi said that a massive transformation has been underway in the energy market with consumption growth shifting from the developed world to the emerging and developing economies. “The world has seen prices on a roller coaster for much too long. We need responsible prices to balance the interests of both producer and consumer,” Modi said. The Prime Minister said energy demand in India is projected to grow at 4.5 per cent in the next 25 years, while gas demand was expected to triple. “We need a transparent and flexible market…there has to be a mutually supportive relationship between producers and consumers. Efforts at artificially distorting prices are self-defeating as history has shown us,” he said. “Let us build a global consensus on responsible pricing which will serve both producer and consumer. In a period of global uncertainty, India needs energy security,” Modi added. He pointed to the transformation in the energy market with the Shale Revolution in the US that would soon make America the largest oil producer, the move by oil companies to invest more in renewables and the use of technology like the “internet of things (IoTs), artificial intelligence, robotic process, automation, machine learning and 3D printing” by the industry. In view of these changes, “India provides a perfect setting for discussing the future of the energy section”, Modi said. 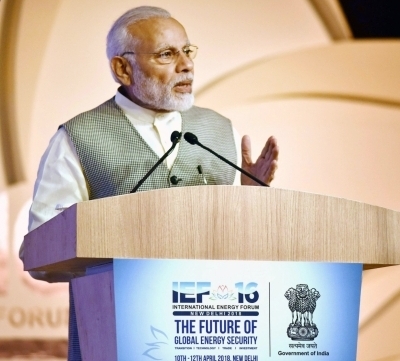 Hosted by India, and co-hosted by China and Korea, IEF16 aims to focus on how global shifts, transition policies and new technologies influence market stability and future investment in the energy sector around the theme of “The Future of Energy Security”. Among ministers from overseas attending the meeting this year are those from Saudi Arabia, the UAE, Iran, Qatar, Nigeria, Japan, China, Russia and the US. Saudi Arabian Petroleum Minister Khalid Al-Falih in his address called for creating “an enabling environment along the entire value chain” as fossil fuels “will be there for some time to come”. Noting that the future supply situation of energy sources, particularly of oil, is “not reasssuring”, he said the producers in the Organisation of Petroleum Exporting Countries (OPEC) “remain committed to the long-term market”.